After two periods of unstable weather where we sheltered in Dieppe and Boulogne respectively, we were faced with just one day of light winds before the unsettled period resumed and so we had to take advantage of this opportunity to get home early. The decision was therefore made for us cruise back all of the way home. I reckoned that low tide at Great Yarmouth was timed for us to pass under the Bure Bridges with enough daylight to cruise all of the way back to Horning before too late in the evening. And that was what we managed to do! 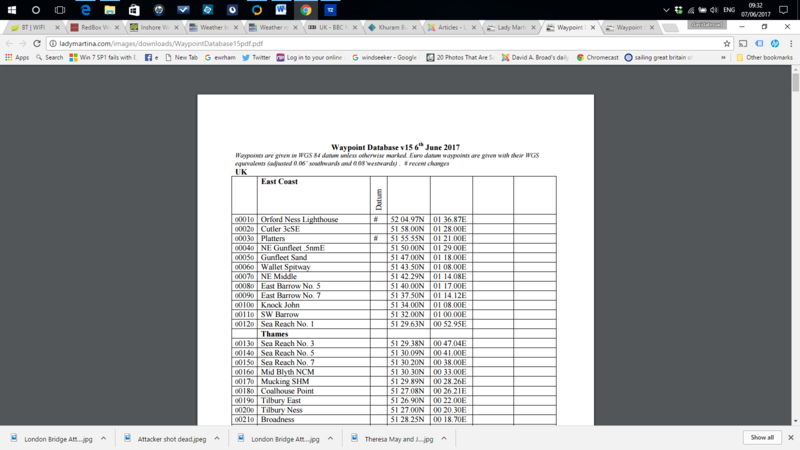 Passages in Lady Martina are made with use of routes based upon a waypoint database that has been built up and updated over some 20 years and safely cruising many thousands of nautical miles in the oceans and estuaries of Northern Europe. Of course, all skippers are responsible for charting their own waypoints and, if too may of us used the same ones, we would collide more often :-). That said, others are welcome to consider mine (via the link above) for their passages and, when in conjunction with reading my Cruising Log, to understand more fully the choices I have made. 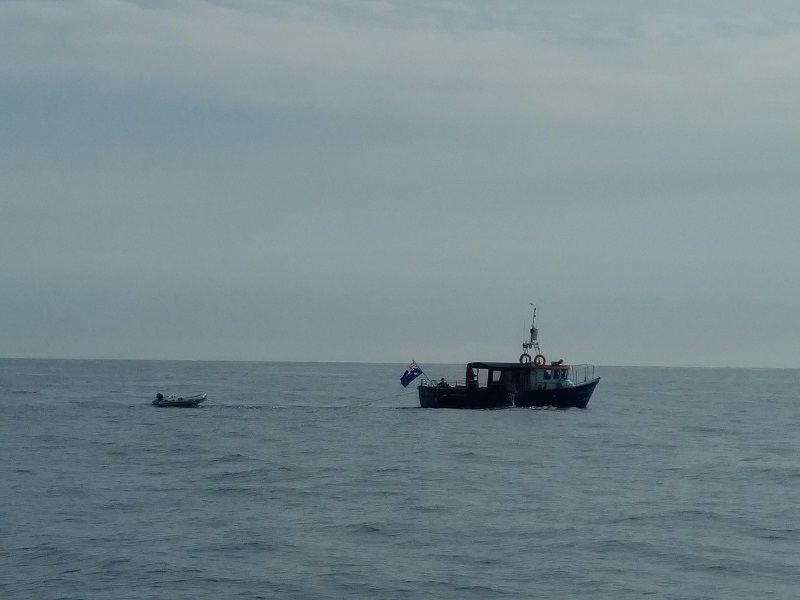 There are more direct routes that could have been chosen, with many passing further inshore, but it is my preference to cruise offshore, often experiencing calmer conditions in deeper water by avoiding overfalls and certainly missing the crab pots and fishing markers which is a bonus! May you have many Fair winds and Favourable Tides! After a week in Dieppe and another in Boulogne, separated by a single cruising day of fine weather, we found another to carry the tide all the way up the French coast, across the English Channel and up the English coast, past Dover and up to Ramsgate. A highlight was passing some channel swimmers at sea. Lady Martina's Cruise interrupted for up to a week with strong winds: Crew allowed home for shore leave! The latest passage from St Valery en Caux to the busy town of Dieppe went well and was completed hurriedly before the arrival and onset of up to a week of stronger winds. 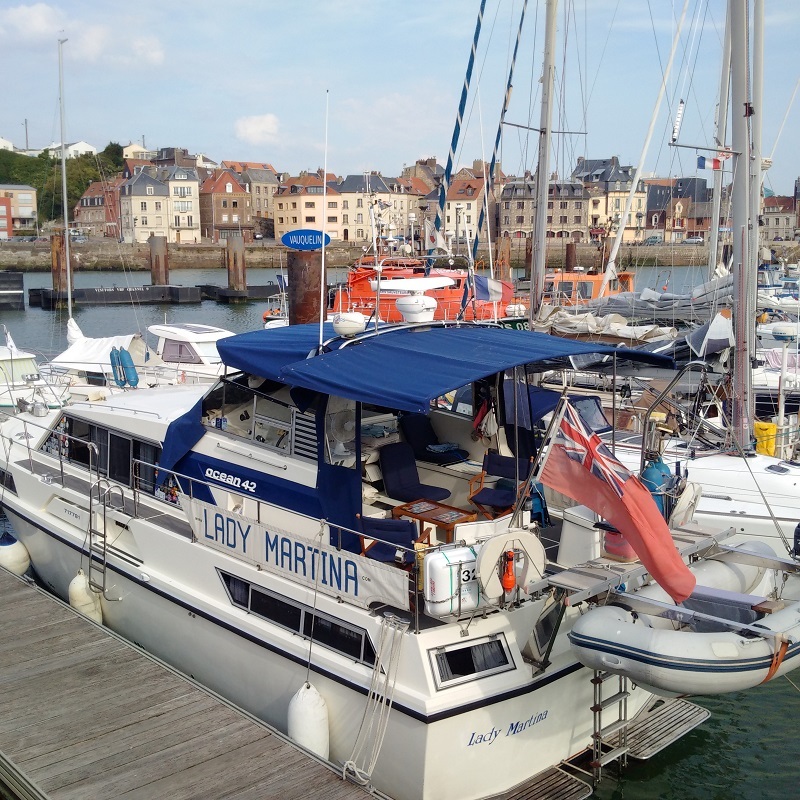 After being decked out with her full Bimini on a very hot day and looking a picture, Lady Martina has been safely mothballed and secured in the shelter of Dieppe Marina for up to a week, whilst the crew have been sent home for shore leave! Most people think of Dieppe as just a ferry port, and of course we are using it for just that, but has great beaches as a holiday resort and is steeped in history. It also has ties with England going back to the 11th century, still has an English church, hotels and Quarter and was an English possession on and off for centuries and thereafter had strong cruise and leisure links with the UK.